Join LYT for a season of plays based on the stories of Shakespeare, starting with the Young Touring Company’s new take on Macbeth. Max just wants to play in the next match. 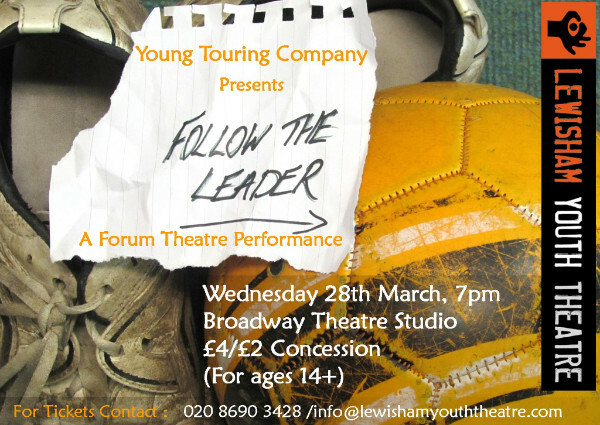 Follow The Leader is a new interactive Forum Theatre performance for ages 13+. You will have a chance to help Max and change the outcome of the drama. The Young Touring Company is made up of 5 young people aged 18-24 who take on roles as performers and backstage assistants. They will be touring Follow the Leader to Lewisham schools and youth settings 14th – 28th March 2018. This traineeship provides leadership training and accreditation. Join the team for two new adaptations of Shakespeare’s classics, written specially for our youth theatre.